Bev’s Girl Films’ is thrilled that our debut short, HIDE AND SEEK, starring Lia Chang and Garth Kravits, is among the top 14 shorts which have screened since January in the Katra Film Series, to compete in the 2016 Katra Film Series – 2nd Round event on Saturday, July 16, 2016, for $1600 in prizes sponsored by Pond5, Moviemaker Magazine, CreatorUp, Goze Zone, Socially Relevant Film Festival. 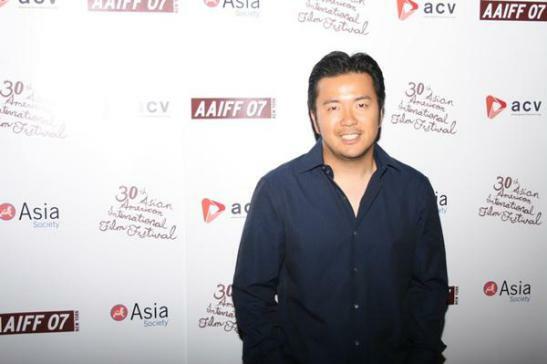 By popular demand, the deadline to submit a short film to Interpretations and a chance to direct a project produced by STAR TREK BEYOND director Justin Lin has been extended to July 15, 2016. Click here for the contest details. The official call for entries began March 31st at CAAMFest and the deadline has been extended until July 15th at 11:59 PM PST. Judging will commence in July and August with the announcement of the Top 15 on September 6, with online voting kicking off that day through October 6. The final 3 winners will be announced online on October 10 and they will be invited to attend the NBCUniversal Short Film Festival on October 19 at the Directors Guild of America in Los Angeles. Participants must be a resident of the United States of America and at least 13 years old. 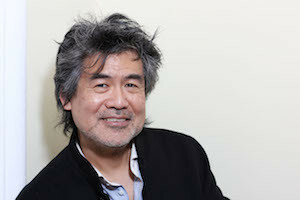 “Interpretations is a great way to form a community of Asian American content creators and filmmakers. We look forward to providing a platform that highlights this community by showcasing the short films on Xfinity Asia and Xfinity On Demand,” says Javier Garcia, Vice President and General Manager for Multicultural Consumer Services at Comcast. 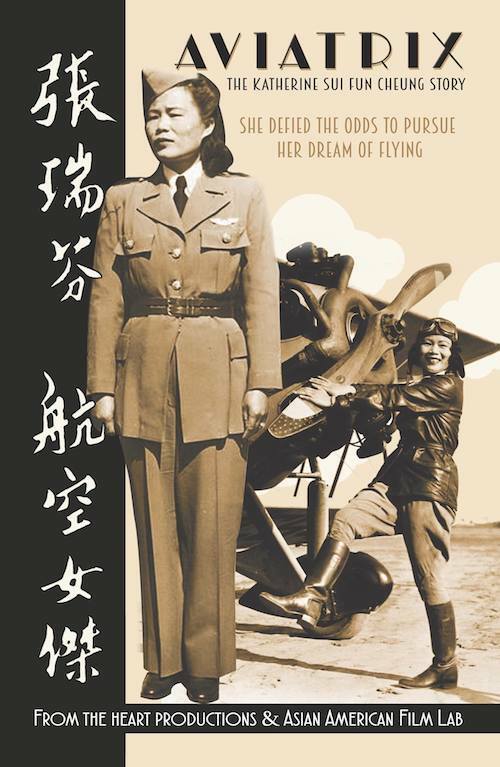 Go For Broke National Education Center (GFBNEC) will launch its new Defining Courage exhibition on Saturday, May 28, 2016, with a Free Homecoming Festival and Film Screening in the Little Tokyo district of Los Angeles. Honoring Memorial Day, the film series examines the war and civil rights in the past and present. Focusing on stories from World War II, the struggle for civil rights in California and the current political climate, these films create a dialogue that links our past with the future. Each film is followed by a Q&A with the director and Mitch Maki, dean of the College of Health and Human Services at California State University, Dominguez Hills. To learn more, please visit www.GoForBroke.org. All films are free to the public. In December 1941, Japan bombed Pearl Harbor. The U.S. was at war. Americans of Japanese descent suddenly found themselves labeled “Enemy Alien.” Over 110,000 Japanese Americans were sent to incarceration camps. From behind the barbed wire, young men volunteered for military service by the thousands. The U.S. Army put them in their own segregated units­–the 100th Infantry Battalion and the 442nd Regimental Combat Team. These became the most decorated unit in U.S. military history. In the Pacific, other Japanese American (JA) soldiers fought heroically in the Military Intelligence Service. 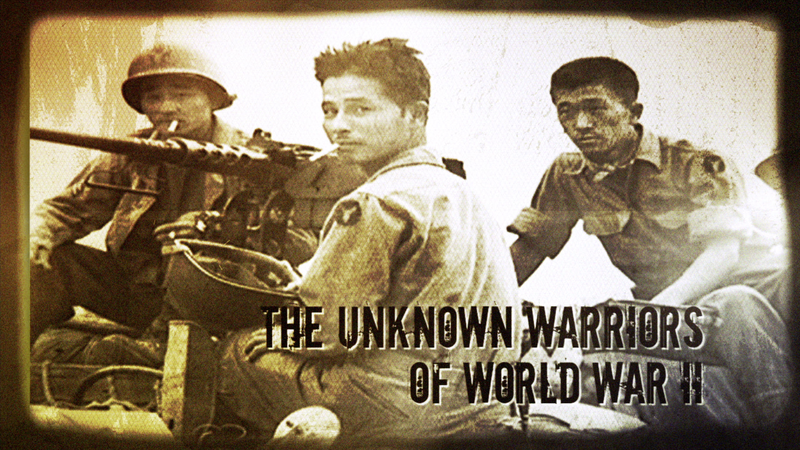 “Unknown Warriors of World War II” shines light on the brave, patriotic legacy of the JA soldiers of World War II. During WWII and the Japanese American incarceration, a Mexican American father and his Puerto Rican wife led a lawsuit including five Latino families against four Orange County, CA school districts that would help to make California the first state in the nation to end school segregation. 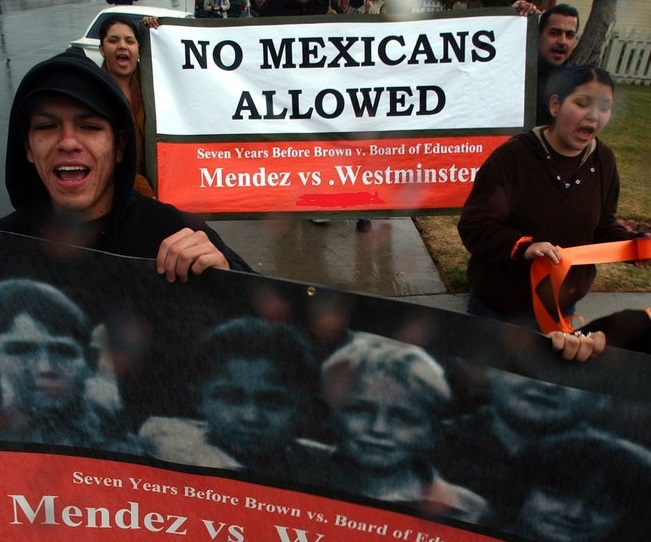 In 1947, the case of Mendez vs. Westminster helped pave the way to the Supreme Court decision of Brown v. Board of Education seven years later. Among many surprises, then-California Governor, Earl Warren, and NAACP attorney, Thurgood Marshall, were involved in both cases. “Voices in Exile” succinctly documents the beginnings of the longest running deportation case in U.S. history: the 20 year trial of the “LA8”. This riveting video examines plans for rounding up Arab Americans, reminiscent of the WWII incarceration of Japanese Americans, and foreshadowing Guantanamo. The ACLU and Center for Constitutional Rights take on the FBI, INS and Justice Department in a courtroom battle over First Amendment rights for all non-citizen residents. Pearl Harbor changed the lives of all Americans, but one group of citizens was affected beyond compare. Japanese Americans were literally stripped of their rights as citizens, and sent to incarceration camps. Defining Courage provides an opportunity for visitors to experience the results of fear mongering and discrimination and reminds us that as Americans, we are all citizens. Through the stories of the Japanese American soldiers of World War II, visitors learn how to act with similar courage in their own lives. GFBNEC will debut its new interpretive exhibition and facilities to the public on Saturday, May 28, 2016. GFBNEC is located at 355 E. 1st St., Suite 200 in Los Angeles, CA 90012. For additional information, visit http://www.goforbroke.org. 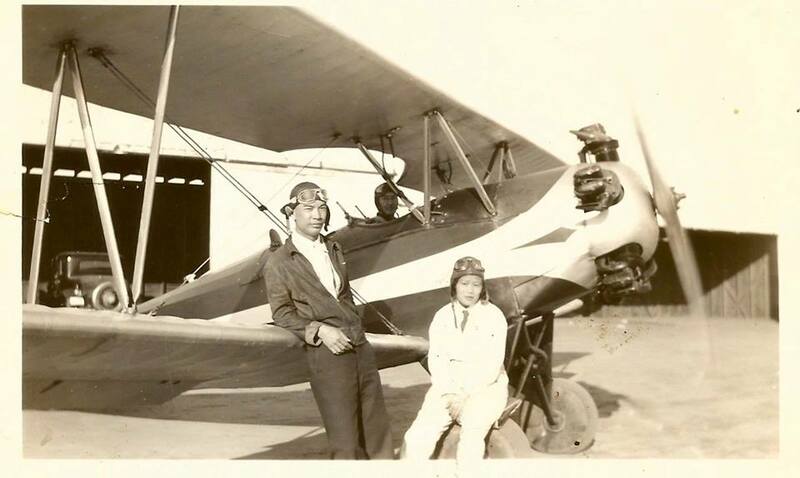 Since its formation in 1989, Go For Broke National Education Center has been committed to educating the public about the responsibilities, challenges, and rights of American citizenship by using the life stories of the Japanese American soldiers of World War II. 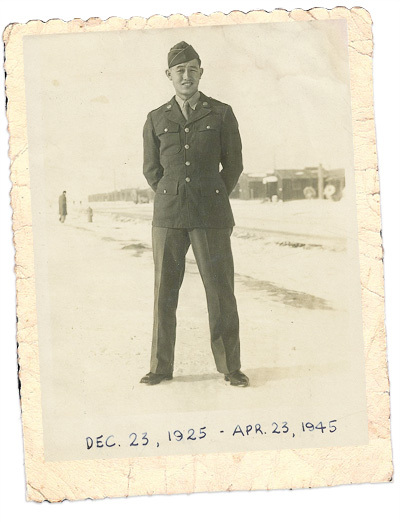 In order to share these stories, they began video recording the oral histories of Japanese American veterans, and today they have the largest collection of its kind in the country. The interviews have been incorporated into a complete curriculum with lesson plans and web-based project learning to share their story with youth across the country. In 1999, GFBNEC dedicated the Go For Broke Monument in the Little Tokyo District of Los Angeles. On the monument are the insignias of the 100th Infantry Battalion, 442nd Regimental Combat Team, Military Intelligence Service (MIS), 522nd Field Artillery Battalion, 232nd Combat Engineer Company, and the 1399 Engineer Construction Battalion. For more information, visit http://www.goforbroke.org. Congratulations to Ed Moy, an actor, an award-winning journalist and filmmaker, who has two films screening at the 2016 Sacramento Asian Pacific Film Festival on Friday, May 27, 2016 in the Comedy/Documentary block of films from 3:00pm -5:50pm. 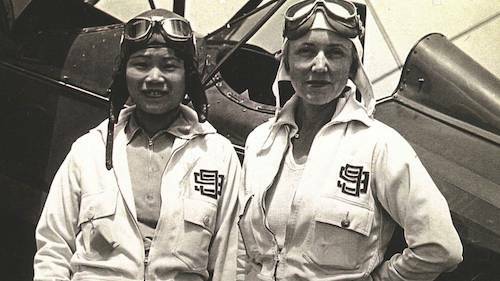 Moy’s documentary short Aviatrix: The Katherine Sui Fun Cheung Story will premiere at the 2016 SAPFF in the Guild Theater, 2828 35th Street, Sacramento, CA 95817. Click here purchase a full festival pass or tickets. 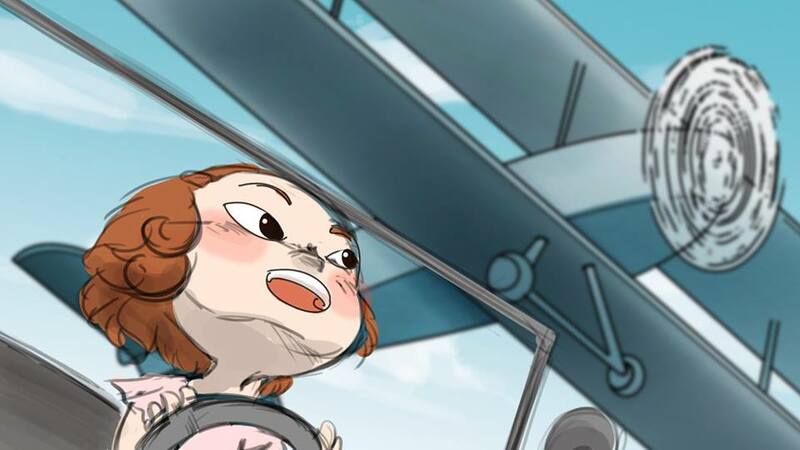 Moy’s Up in the Clouds, a delightful animated short he wrote and directed which was inspired by Katherine Sui Fun Cheung, and features the voices of Katherine Park (Red Dress) and Raymond Ma (The Muppets, Horrible Bosses 2, and Lethal Weapon 4), will screen first. 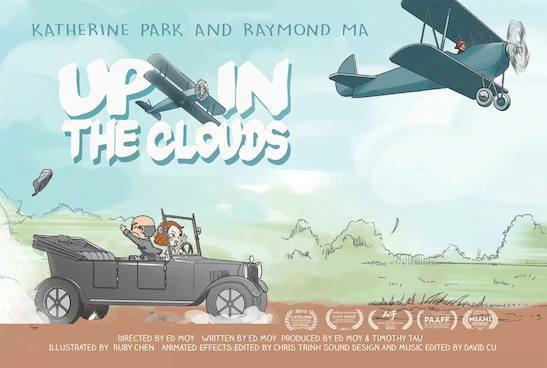 Up in the Clouds is an Asians on Film Festival Summer Quarter 2015 Winner for Best Animation. 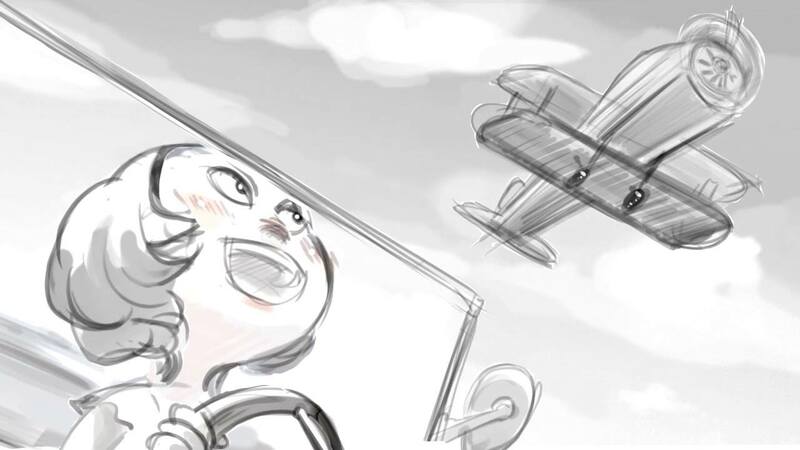 Up in the Clouds was originally conceived as black and white animatic style sketches illustrating Katherine’s story of falling in love with flying while learning to drive a car with her dad next to a dusty airfield in Los Angeles. 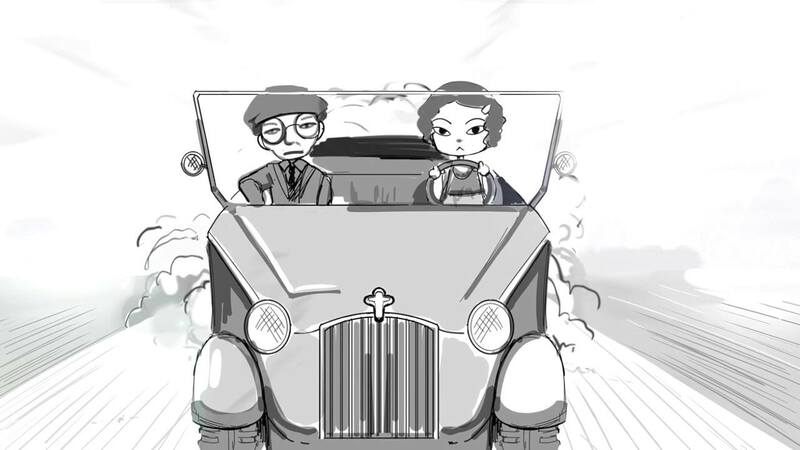 Ruby Chen’s hand drawn illustrations features 1920’s period cars and planes in a cartoon style meets modern anime caricature, which visual effects editor Chris Trinh animated with motion and movement. 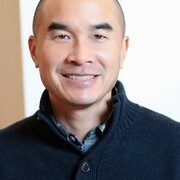 Additional production credits include David Cu (sound and music editor), Nicole Echegoyen (graphic artist) and Birdie Sawyer (trailer video editor). 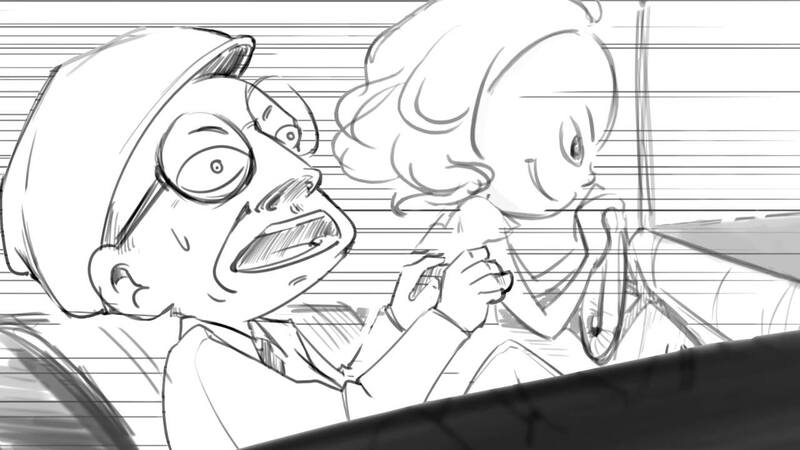 Additional funding was provided by executive producer Tau for the color illustrations, and by Moy for the colorized cartoon. The 2016 Sacramento Asian Pacific Film Festival runs May 27 – 28, 2016 at The Guild Theater, 2828 35th St, Sacramento, CA 95817, and will screen 30 films. Ticket purchasers may buy either a Full Festival Pass for access both days; all day Friday (3PM – 10:30PM); all day Saturday (11AM – 10:30AM); Half-Day Saturday day (11AM-4:30PM), or Half-Day Saturday evening (5PM -10:30PM). Click here purchase a full festival pass or tickets. Access all Screenings, both Festival days! Students may be requested to provide a valid student ID. Seniors are 62 years young and up. The signature event of the Sacramento Asian Pacific Cultural Village, SAPFF serves alongside a continuum of events and programming in support of traditional and contemporary Asian and Pacific Islander artistic expression within the Sacramento Region. Since 2013, SAPFF has been a champion of independent films featuring the works of Asian Pacific Islanders in front of and behind the camera. For more information about the Sacramento Asian Pacific Cultural Village, the Sacramento Asian Pacific Film Festival, or to see how you can get involved send an email to info[at]SAPFF.org, or call (916) 776-6036.